I am so unbelievably excited for this! If you have been following my blog for a while, you’ll no doubt remember the multiple posts that were on my blog last year featuring Emily Harvale. Don’t worry, I’m not a stalker, but I am a huge fan and I am so pleased to say that she is back! That’s right folks! If you’re new to my blog I highly suggest you go and look for Emily Harvale’s back catalogue featuring ‘Lily Pond Lane’, just so you’re ready for the new instalment to land soon (hopefully). Hell, even if you’re not a new follower but you haven’t read the books, then I suggest you do the same! I am delighted to be revealing the cover of Emily’s upcoming treat, ‘Return to Lily Pond Lane’. Here we go!!!! Isn’t it pretty?! ‘Return to Lily Pond Lane’ is due to be released on the 26th February, and you can pre-order your copy right now from Amazon. I’m so excited!! Third and final cover reveal of the day is for a change of direction for a very popular author. 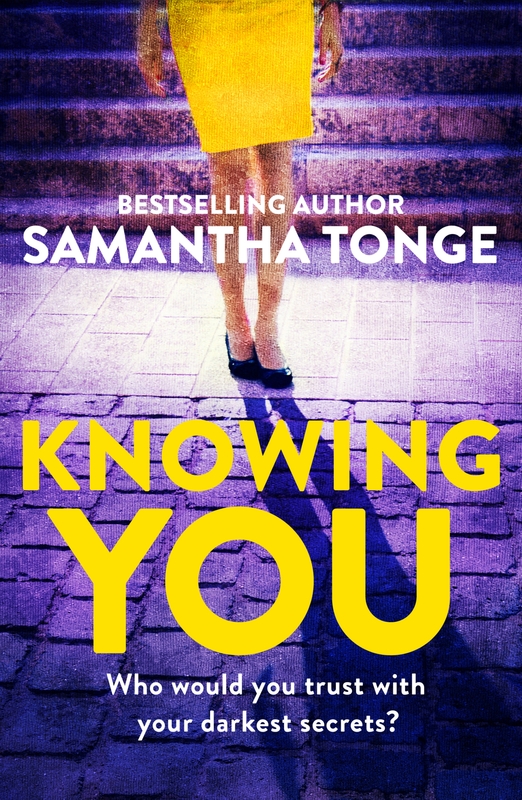 Samantha Tonge is going a little bit darker with her brand new novel, ‘Knowing You’, and I am delighted to be revealing the cover today! I am so intrigued! Cannot wait to read this! How gorgeous is that!!!! I have every single one of Heidi’s novels in paperback, and this one will look STUNNING beside the others!! If you are very eager and want to pre-order your copy of ‘Poppy’s Recipe For Life’, you can do so now via Amazon UK as it will be released into the wild on the 30th May. It’s a multiple cover reveal day here at TWG, and I an soooooo excited! I love cover reveals!!! First reveal of the day is for an author who is best known for making her readers ugly cry…..all the way from a very sunny country….. Some might say that her books are unexpected…..
Are you ready for this? I am delighted to reveal the cover of Kelly Rimmer’s upcoming novel, Unexpected. Thank you to the lovely Phoebe Swinburn for asking me to do so! The next three decades of Abby Herbert’s life are as carefully planned out as the last three were. Best career ever? Check. Great friends, one of whom she lives with in a stunning TriBeCa apartment? Check. Perfect man to share her dream family? Surely just a matter of time. But then she gets devastating news from her doctor – if she wants to get pregnant, she needs to get started on that by…well, yesterday. On the bright side, she has the perfect person in mind to be the father. Unexpected by Kelly Rimmer will be published by Headline on the 28th May, but can be pre ordered now from Amazon UK. It feels like it’s been ages since I last did a cover reveal, but fear not loyal TWG followers, I have one for you all today!! That’s right! Thanks to RaRaResources and Eliza Scott, I have the pleasure of helping to reveal the cover of ‘The Talisman – Molly’s Story’ – thank you for having me on board! Isn’t it pretty? If you’re eager to read The Talisman – Molly’s Story, it will be published on 4th February. Not too long to wait! I was asked by the fabulous, Becky Hunter, from Headline Books, to reveal the cover of Hannah Doyle’s upcoming novel. Of course I said yes!! I adored Hannah’s previous novel, ‘The Year of Saying Yes’, so it is an honour to have been asked! ‘Just My Type’ is due to be published by Headline in April 2019, but is available to pre-order right now from Amazon. Are you ready for the cover?!?? JUST MY TYPE is the second novel from Hannah Doyle, author of the laugh-out-loud hit rom-com THE YEAR OF SAYING YES, perfect for fans of Love Island, What Fresh Hell by Lucy Vine, Anna Bell and Dolly Alderton’s Everything I Know About Love. He’s my type on paper . . . but IRL? Best friend Mila decides that Jasmine needs a new ‘type on paper’, because Jasmine’s current criteria is so off that her dating history is one long line-up of fools. So Mila challenges Jasmine to look once, if not twice, at the guys who wouldn’t normally fit her ‘type’. With nothing to lose, Jasmine accepts. Maybe, just maybe, she’ll surprise herself. I don’t know about you, but I am so very excited to get my hands on a copy of this! It sounds right up my street! I don’t like to wish time away but hurry up April! Despite being a novella sized read, ‘Christmas Spirit’ sure has Hell packs a punch in such a short space of time. Instead of doing what a lot of people do where the homeless are concerned, Evie decides to spend her Christmas giving back to the community, yet she ends up being the person who finds herself facing the harsh reality of uncertainty as she speaks to the homeless, trying to understand their situation. Personally I think the topic of this novella is certainly poignant and one, if I’m being totally honest, I wouldn’t expect in a Christmas read. Not that that is a bad thing btw, because it isn’t. The fact I wouldn’t usually expect it meant that I sat up and took notice. I guess one might say that this nifty little book put things in perspective. Despite the serious undertone, ‘Christmas Spirit’ made me chuckle and had that feel good element down to a fine art. I haven’t read many of Nicola May’s books but after this one I certainly will be. Nicola May lives near the famous Ascot racecourse with herblack-and-white rescue cat, Stan. Her hobbies include watching films that involve a lot of swooning, crabbing in South Devon, eating flapjacks – and, naturally, enjoying a flutter on the horses. There’s nothing like warming the cockles with a book about a Teashop – I don’t know about you, but I am absolutely freezing cold and the thought of a piping hot cuppa is rather pleasing! I’m sorry to disappoint though as I have no cuppas, however Rosie may have some in her travelling Teashop! Shall we take a look?! And a tiny problem with not filtering the things she shouldn’t say. Until Rosie’s thirty-second birthday when her life takes an unexpected turn and she grapples with this new version of herself. Can she be the kind of person that lives on the fly? Who takes risks? Who doesn’t know what each day will bring! Rosie’s a dab hand at cooking but can she get the recipe right for her own love life? A perfect holiday read about taking chances, learning to love yourself, and living outside of ordinary! Ohhhhh I’m so excited today!!!! I have been asked by the lovely, Phoebe Swinburn from Headline books, to help reveal the cover of Kelly Rimmer’s new novel, ‘The Things We Cannot Say’. I am a hugeeeeeee, HUGE fan of Kelly’s – it’s an honour to help out with the cover reveal, so thank you!! It feels like a bit of a ‘Kelly Rimmer’ day on TWG today as you’ll never guess what….I will be sharing my review of Kelly’s latest novel ‘Before I Let You Go’ as part of the blog tour for the paperback release! Make sure you check back later! However, back to the task in hand and the beautiful new cover! Are you ready for this? I cannot wait to get my hands on this beauty!! Inspired by the author’s family history, a searing page-turner of war, family secrets and a love to defy all odds. When Alice’s cherished grandmother is hospitalised, a hidden box of mementoes reveals a tattered photo of a young man, a tiny leather shoe and a letter. Her grandmother begs Alice to return to Poland to see what became of those she held dearest. I am so looking to reading this! What do you think? Is it up your street? Are you a fan of Kelly Rimmer? If so, which book is your favourite? Let me know your thoughts on the cover in the comments! Please note that publication dates are subject to change at the publishers discretion! To keep up to date with the latest news from Headline, you can follow them on twitter Here. Or, if you wish to have the latest news of all things Kelly Rimmer, you can follow her on twitter Here!